***WINTER WEELKY SPECIAL $99/nt AVAILABLE OFF-SEASON ON A FULL WEEK OR MORE STAY. This 3 Bedroom Condo is Located in Buccaneer Village an Beautiful building complex perfectly located and short walking distance to all the spectacular amenities of Pirate's Cove. This individually styled 2 story Penthouse condominium provides great water views overlooking Roanoke Sound and a peaceful freshwater pond and canal. It features a Westerly looking Sunset View and contains a fully appointed Chef kitchen and a spacious deck. Pirate's Cove boasts a protected, deep water, full service marina consisting of 179 slips and a charter dock of 24 sportfish boats, which ranks as one of the world's finest marina with the most most experienced captains. The depth within the basin at mean low tide is between 7' and 8', with a tide of only about 1'. The canals all maintain a minimum 5 foot depth. We have a fuel dock for gas and diesel, but almost all of the boats can fuel right in their slips from mid-fueling stations strategically placed along our docks. This unit is a Non-Smoking,Two Story End Unit Penthouse layout with 3 Bedrooms, 2 Baths, and QSS Accommodates 6. Master Bedroom includes 1 King bed, Bedroom #2 has 2 Twin beds and Bedroom 3 is a small alcove that has Twin Bunk Beds for children plus a pull out QSS in the Living Room. 2 Story Penthouse End Unit located next to the community pool and tennis courts. The 25' dock space #4 is included FREE with YOUR stay. Covered Parking for 1 vehicle and 1 additional off street parking for additional vehicle. Your boat trailer can be parked in a nearby storage lot for your convenience. And speaking of music, Roanoke Island events do an excellent job of bringing bands and solo musicians to restaurants, outdoor venues, festivals and marinas in Manteo and Wanchese. Some are big — Jefferson Starship, Led Zeppelin and Beatles cover bands, Journey! But this is also a great chance to listen to some local music — maybe you’ll even discover your new favorite genre! In fact, Manteo events can now boast a summertime festival of big name country singers in the Island Opry! Check out Manteo's nightlife. ***** 2017 Summer Schedule FOR KIDS OF ALL AGES ! Guests Vacationing at Pirate’s Cove Resort have the option to add any of the recreation programs listed below to their vacation. Call directly to Pirate’s Cove Recreation Department and reserve your space before your arrival. These classes and events fill quickly and many have a maximum limit. The Recreation Program runs the Saturday before Memorial Day to the Saturday before Labor Day. 2:00-3:00pm Abstract Painting- Whether you are an experienced art enthusiast or a beginner. Abstract painting will encourage you to flex your creative muscles by playing with shapes and colors in order to create beautiful works of art.$10.00/canvas. 12:00-1:00 p.m. Hotdays, Hotdogs, and Hamburgers at the Hotspot- Please join us by the pool for grilled hamburgers and hotdogs. Prices Vary. 2:00-3:00 p.m. Tie-Dye T-Shirt- Join us to make a groovy tie dye tee! We’ll teach you how to make cool designs. Pick from bright summer colors! $12/shirt. 10:30-11:30- Temporary Airbrush Tattoos - Come get inked Design your own and make them something special and unique! $10.00/color. 3:30-4:00 p.m. Candy Factory- “Yummy for your Tummy” we’ll be using many different flavors and colors to design a treat you can eat. $4 each. 10:00-11:00 a.m. Mosaics- Explore your creative side and design your own work of art. This class is for children as well as adults. Make a beautiful piece of art. $15.00/each. 3:00-3:30 p.m. Iced Coffee Bar- Treat Your Taste Buds at our “Pirate’s Cove Clubhouse Coffee Bar”. Enjoy iced coffee with your choice of flavoring! $2.00/cup. 6:00-9:00 p.m. Lil’ Pirate’s Club- Join us for an evening of fun! We’ll make crafts, play games, have snacks, and much more! Ages 4 to 10. $25/child and Maximum of 15 kids. Minimum of 3 kids. Must sign up 24hrs in advance. 2:00 - 3:00 p m - Tie-Dye T-Shirt - Join us to make a groovy T-Shirt in WILD CoLoRs . 3:30 - 4:00 p.m. Candy Factory- “Yummy for your Tummy” we’ll be using many different flavors and colors to design a treat you can eat. $4 each. 3:30 - 4:00 p.m Ice Cream Floats- Come join us at the clubhouse to make a Float - “soda fountain” style! $1.50/float. Description: Runs length of Roanoke Island along US 64/264. Access at Pirates Cove runs past Roanoke Island Festival Park and into downtown Manteo. So feel free to bring your bicycles, or Rent some at PC Clubhouse ! Simply addicted to the Pirate's Cove Lifestyle. We love to fish and our Children and Dog have been visiting Pirates Cove since 1990. Simply the Sportfishing Capitol of the World... If you haven't fished the Outer Banks and enjoyed the Southern Hospitatily you need to come here and see just what you've been missing. This property is located on the Roanoke Sound includes exclusive use of your own 25' Boat Slip #4 outside your door. Visited Manteo for the holidays... What a great time of year to come. No traffic, no lines at any restaurants... Visited the Lighthouses, Jennette's Pier, Kitty Hawk, Duck and Corolla. We made plans to return in the spring... Brian is Great to work with, we enjoyed our stay. We really enjoyed this pleasant condo. 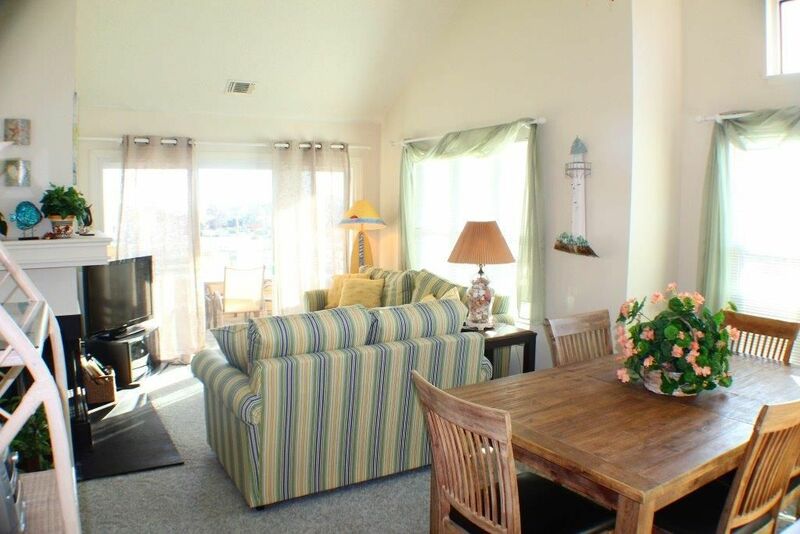 Pirates Cove is a very nice development and perfectly located for a quick jaunt by car to the beach or into Manteo. We docked a 20 ft boat in the canal which worked like a charm. The slip had electricity with standard power outlet. Only downside is that there is no onsite storage for a trailer. Trailer storage is good and safe but $65 a week. Bryan was very helpful. Restaurant tip: The Tale of the Whale on the causeway was recommended to me by a local and was an excellent seafood restaurant. It is a bit old school in style and provided our best meal of the week. Only downside to the condo is a very sticky lock. This should really be replaced. Otherwise, the accommodation was very comfortable and well maintained. It was our first trip to OBX. Can’t imagine a better place to stay in the area. This was a perfect location for us with a boat slip and it being pet friendly, perfect for our last minute trip for fishing! The owner was pleasant to deal with and addressed any issues immediately. We Love This Place ... The Kids always Hate to Leave ! We have been renting from Brian at Pirate's Cove for the last 9 years and we have reserved our dates with him and are headed back again next year. We love everything about the Pirates Cove community and Brian's Condo is just so close to the swimming pool, clubhouse, restaurant and marina! Brian includes a 25' boat slip free with his generous two story condo. It is a gated community where the guards will know your name/face and greet you warmly every time you walk/ride/drive near. You will love the Sound Sunset view from the condo, so pretty, and in the summer, you will see dolphins every day on the Sound. Last year we stayed for a week ON the ocean and then 2 weeks in Pirate's Cove in at Brian's home. We decided that no matter where you are, it is pretty much still a pain to go to the beach. Even if you're right on the beach, you still have to lug your stuff that you need. From Pirate's Cove, keep the cooler, umbrella, chairs all in the car... it is a very short drive and free parking at Jennett's Pier. At Pirate's Cove, there are plenty of activities for the kids every day. We always bring bikes/skateboards/Ripstik, etc. The speed limit in the community is 15 mph. We also bring fishing poles and fish in the small pond area that is stocked (catch and release) and also off of the docks. One year I found a small seahorse! The kids are always setting the crab traps and finding a crab. Sometimes they are big enough to cook. The pool has activities all the time (crafts, BBQ, tee-shirts), some of which kids will be interested in. There is always a good crowd of teenagers, hanging at the pool, around the community or at the clubhouse. Yes, the restaurant had changed, but it will always be very good food. We go there almost every day for wings and a bucket of Coronas and watch the fishing boats come in with the day's catch. There are so many activities nearby, restaurants, swimming, fishing, jetskis, boating, beach, go-karts, putt putt golf, arcades, hang gliding, shopping.. and daily Kids Camp at the PC Community Center....lots to do! Any other questions, Brian is always willing to help and answer questions... all you need to do is ask him! comfortable, clean and perfect location! Condo was clean and comfortable. Location was superb. Close to pool, tennis, game room, playground, restaurant and having our boat docked right out our backdoor was icing on the cake. I especially loved the 4 miles of walking trails for my morning walks. My only complaint was this particular unit the 3rd bedroom was more like a closet without a door. We made it work. I just wish I was informed since the website advertised 3 bedrooms. We were on the 3rd floor which was ok but also should be notified since that was pretty tough on the knees.